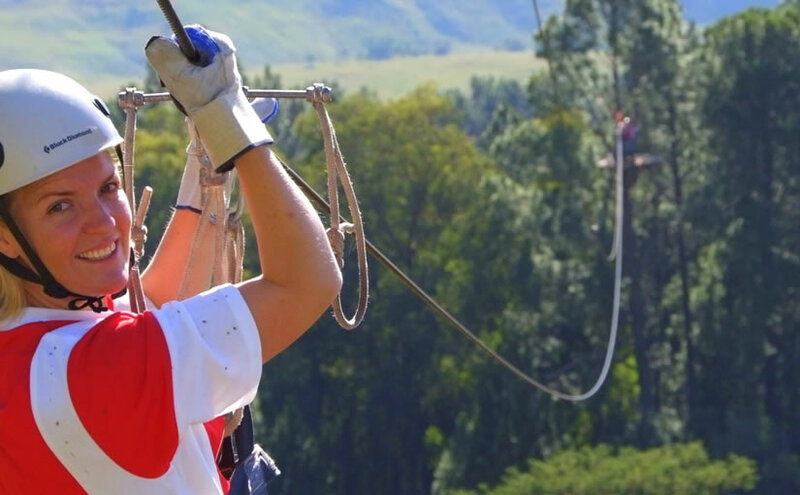 Ten Great Adventures at one fantastic venue, central to all Northern Berg Resorts. Experience the thrill of sliding 60kmph on 900m of cable between 7 forested platforms, throwing triple back flips on the bungee bounce or flying on a circus trapeze. For a bigger thrill climb Africa’s highest wooden spiral staircase and free fall 17m on the King Swing. If you’re happier with your feet on the ground there’s quad tours or paintball, and included in every ticket purchase is access to the new Kid’s Adventure Zone’s Duelling Zip Lines and Ninja Warrior Jr. Course. And when you’re done with that, there’s the coffee shop, with a giant cappuccino and killer chocolate cake! Our most popular experience. An exhilarating and scenic ride on 900m of cable between 7 forested platforms. A 15km guided Adventure Trail though Montusi Gorge, Rocky Pass and the Waterfall Challenge. Forested arena. 100 balls. High Powered guns….Definitely not for the faint hearted. 17 meter free fall swing from a tree top suspension bridge accessed by a spectacular 21 meter spiral stair case! The same breathtaking climb followed by a 175 meter cable slide to tree top platform 6 and 125meters back to the Center. An authentic circus trapeze – learn a knee hang and a back flip dismount. An four way trampoline, winch and bungee system – see how many back flips you can do in 5 minutes. Great savings on Adventure Centre Favourites. Enclosed play are that includes Ninja Warrior Jnr course, trampoline and dueling Sit & Zips. All Out Adventures now offers 50km of permanently marked mountain bike trails. All Out Adventures now has two new activities, Bubble Soccer and Bubble Boxing, experience the thrill of full contact football or heavy weight boxing. 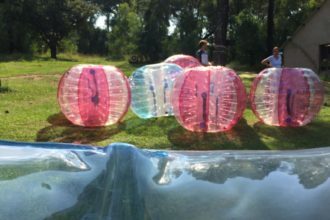 Bubble Soccer – maximum of 4 players per team and Bubble Boxing – either one on one, teams of 2 -4 or last man standing. Giant cappuccinos, killer chocolate cake and the best toasted sandwiches from here to New York. For your safety and enjoyment certain conditions apply.